The ever growing popularity of crossovers and SUVs means new models have to have an edge to succeed. And as the main criteria for most potential car buyers is appearance a design which stands out amongst the masses is crucial. It’s a fact that Mitsubishi obviously concentrated on when it gave the go ahead for its latest model, the Eclipse. Available in either two or four-wheel-drive the Eclipse has a bold front with deep chrome-edged boomerang-shaped cutouts, dramatic flowing shapes in the metal on both sides and a distinctive twin section rear window. It’s not a car you will miss. Inside there’s plenty of room for five passengers and the 60:40 split rear seat slides backwards and forwards to allow you to create more rear legroom or more luggage space depending upon your needs on the day. Unusually you can also adjust the rake of the rear seats. The Eclipse Cross 4 is well equipped and comes with full leather seating – with usefully large side bolsters on the heated front seats to hold you in place, a head-up display, double glass sunroof and a large seven-inch eye-level touchscreen for activating onboard features. There’s no factory-fitted satellite navigation available though, but you can connect your smartphone to the car to use your own mapping system. The Eclipse is packed with a host of safety features including forward collision avoidance, lane departure warning, cross traffic alert and full LED headlights with automatic dip/main beam function, which is one of the reasons it has been given a five star safety rating. A large rear window gives good vision for reversing but the rear spoiler cutting across it can be a bit annoying. Having said that the rear view camera is a real boon giving not only a view of what’s behind you but also a birds-eye view at the same time which – in conjunction with front and rear parking sensors – makes manoeuvring simple. The Eclipse is powered by a 1.5-litre petrol engine which pulls well and is impressively quiet in action. Even with five people the ride is good and there is no roll to speak of so it responds well when you need push on briskly. The gearshift is a little long for my liking but the box itself has a nice smooth clean action with little to find fault with. Fuel consumption is impressive and on numerous occasions I managed to achieve the official figure of just over 42 miles per gallon which is rare in any car today. 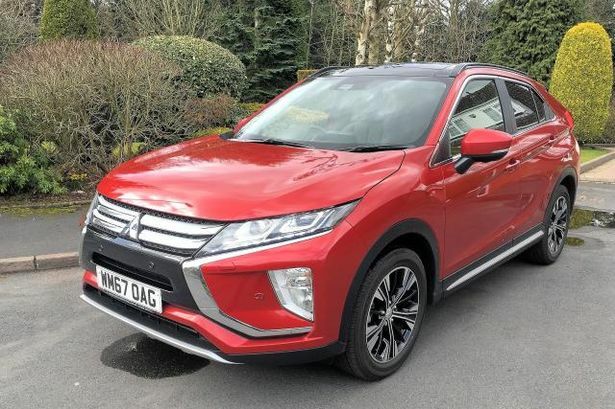 Falling between Mitsubishi’s ASX and the larger Outlander the Eclipse is an ideal family car and best of all with prices starting from £21,275 for the entry level model is exceptional value for money. Mechanical: 163bhp, 1,499cc, 4cyl petrol engine driving front wheels via six speed manual gearbox.